The Citation Latitude, Cessna’s newest midsize business jet, made its public debut this week at the annual National Business Aviation Association (NBAA) Convention & Exhibition. The aircraft on display is one of four Citation Latitudes flying in the company’s certification flight test program, which has logged more than 600 flight hours in 260 flights. Performance improvements demonstrated in the flight test program have prompted Cessna to update the aircraft specification to reflect an 8% greater range to 2,700 nautical miles at long-range cruise speed, and shorter runway performance with takeoff distance now an impressive 3,668 feet, company officials report. Type certification is expected in the second quarter of 2015. Announced at NBAA three years ago, the Citation Latitude features the widest fuselage of any Citation jet, a flat cabin floor and six feet of cabin height, Garmin G5000 avionics, and two Pratt & Whitney Canada PW306D engines with auto-throttle capabilities. 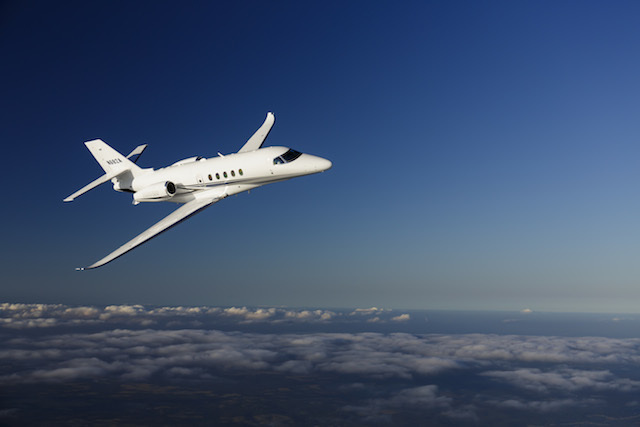 The Citation Latitude accommodates up to nine passengers and can reach a flight level of 43,000 feet in 24 minutes. It also features cabin airbags for passengers in side-facing dual or single seating configurations. The Latitude prototype first flew on schedule in February, followed by two additional aircraft in May and July. Cessna gained FAA Type Inspection Authorization (TIA) for the Latitude in May.